I know you’ve been searching, just as I have, for the perfect banana bread recipe. There are breads out there that use chocolate chips, various nuts, pumpkin, bacon, and all kinds of other wonderful things to add to banana bread. I have enjoyed many of them! 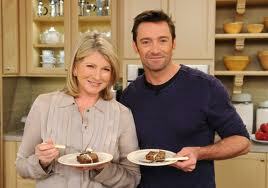 However, I once had the pleasure of watching Hugh Jackman visit Martha Stewart on a replay of her show on tv, and, as handsome and charming as he is, I was distracted by the banana bread. rendy additions. No unusual techniques or fancy names. It was just banana bread. Since I had a bunch of bananas my sons never bothered to eat this week, and which were nicely spotty and ripe, I decided to throw caution to the wind and just be…simple. ed with the results. 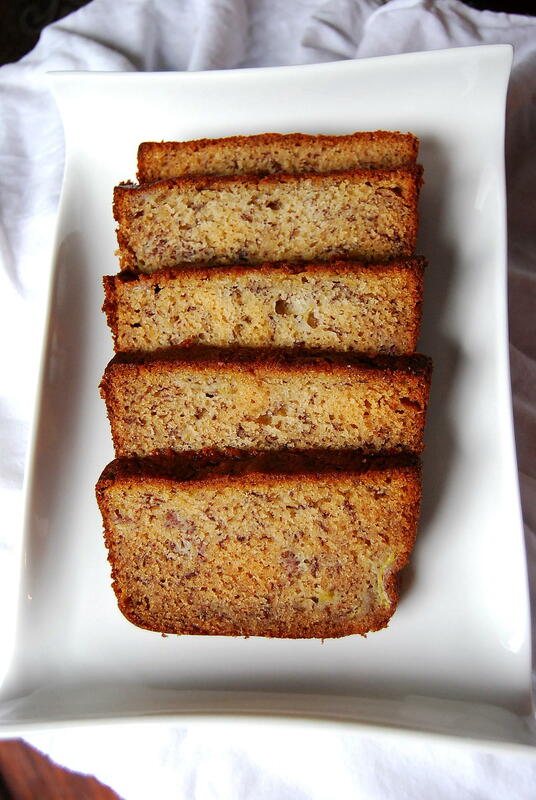 This is the best banana bread I’ve ever eaten! The best tip: use butter instead of oil in your breads. I am with Martha on this one from now on. It has a lighter, though still dense and moist, texture, and the flavor is much better. I was shocked at the difference. I hope you enjoy this bread as much as I did; my boys had it for breakfast, and they went back for seconds, eating it with a tall glass of cold milk in hand. That made this mama very happy. Check out one of my latest posts: 4-ingredient cinnamon-peach biscuits! So easy, and so delicious. < strong>Perfect fall dessert: Fruit and nut-stuffed baked apples – simple, rustic and delicious!< a title=”In the Kitchen with Mama Steph” href=”http://www.kltv.com/category/209490/in-the-kitchen-with-mama-steph&#8221; target=”_blank”>See more recipes from my cooking segment, In the Kitchen with Mama Steph, on KLTV-7 and KTRE-9 in East Texas! I invite you to join me on my Facebook page, as well, for recipes, conversation, inspiration, with a few laughs along the way!< a href=”www.facebook.com/mamastephon7″ target=”_blank”>Enjoy!< em>Copyright 2012 Stephanie Hill-Frazier. All rights reserved. It is the best! I added a little bit of cinnamon and nutmeg for those yummy fall flavors, was delicious! Amazing! I’ve made quiet a few bb in my time and none have been this easy or as tasty. I am going to use muffin cups for my next time. I have finally found my go too forever bb recipe. Thanks so much. Your recipe calls for 1/2 a cup (1 stick) of butter. However 1 stick of butter is 1/4 cup. Which is correct? Haha…yes, I think Land o’ Lakes packages in the half sticks, so I can see why that threw you off for a sec. 🙂 Enjoy! It’s a great recipe! Rats, I just saw this. I used a whole stick and just put it in the oven. A stick is correct, Misty. A stick of butter is a half cup. It’s just that a few brands do 1/4 cup sticks, but this recipe calls for 1/2 cup. That sounds amazing, Ashley! Great idea! How’d it turn out? I’m going to say it was a huge success since my family devoured it before I had a slice and asked when I was making it again lol. Oooo! That sounds yummy. I’ll have to try to make it that way too. I just made the original recipe and it was great! I threw a few mini-chocolate chips in it instead of the nuts and it was lovely. Huge hit, definitely my go-to from now on. Yes, all purpose = plain. Just don’t use self-rising. Hope you like it! You are most welcome, Rachel! I’m happy to hear it! i’ve been making this recipe since it came out in MS magazine (there was also a coconut lime one in the same article that’s quite good) and this has become my go to standard recipe. i’ve tried a LOT and i love this one… i add just a splash of lemon juice and other than that, i stick to the recipe…. one tip for you, if you want even more buttery, rich flavor bake it with European/French or Irish butter…. sublime. the sour cream/yogurt is the ticket, don’t you think? So yummy! I made it without the sour cream only because I had none and it still turned out moist and delicious! Will try with Greek yogurt next time! I’m glad you liked it, too, Nicole! 🙂 Greek yogurt would be a great addition. 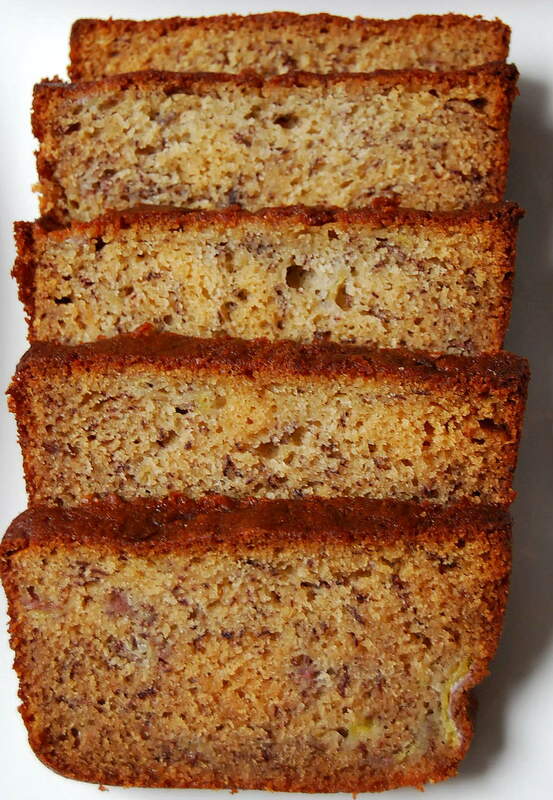 I’ve been searching for the perfect banana bread with a nice flat top, and your pictures look like this is the one! 😀 Can’t wait to try it! Can I substitute pumpkin in place of banana? Going to try making this with vanilla Greek yogurt and omit the vanilla. I really don’t feel like driving to the store. Fingers crossed!! I don’t have a loaf pan so I’ve only made this in muffin form and it turns out pretty well! I have some in the oven as I type, this time I made some in a mini muffin tin as well, cross your fingers it turns out! This banana bread recipe is the best I’ve ever made hands-down!!! I’m baking some as we speak😊. I do add cinnamon because a staple in my banana bread recipes and I put a vanilla sugar glaze on top. I’ve brought this over to friends’ as housewarming treats and everyone always asks for the recipe. Thank you! P.S. I omitted a stick of butter, subbed one egg for applesauce and added flax seed these time. I’ll let you know how it turns out! I’d love to know how it turns out woth the changes, Cheri! How much flax seed did you add? Great recipe. Easy and turned out moist and full of flavor. Perfect banana bread. Made it twice. Next time I will add coconut.great. This was my first time ever making banana bread and this turned out great! Very easy recipe and absolutely delicious, this will definitely be my go to recipe in the future, thanks! Best banana bread ever according to my husband and many friends. I add 1/3 a cup of chocolate chips. They don’t distribute that evenly, but frankly I could care less. So delicious. Hey Amy! I’m so glad he approved. 😃 Also, running the chips through some flour before adding to the batter helps keep them suspended, just fyi. Have a great week! My family loves this banana bread! Every time I buy bananas I have to buy extra to set aside just for this bread. It usually only lasts a few hours before it’s all gone. They like it when I add in raisins and a teaspoon of cinnamon. I love subbing Greek yogurt for the sour cream as well! It works fantastically. Have you tried adding cinnamon or chocolate chips? If I bake them using smaller bread pans, what would you recommend for the temperature, and time in the oven? Hi Shawn! I’ve not experimented with that, but I’d leave the temperature the same and test for doneness sooner. It may take a few tries with a toothpick until you get it just right! Good luck! This is now my go-to recipe! Love it so much. I’ve experimented with it a little – I cut back on the sugar and use vanilla or coconut greek yogurt. I love to add chocolate chips or saskatoon berries, and I always put in a dash of cinnamon. Sooooo good! I used a single serving of the limited edition pumpkin yogurt in place of sour cream. It was gone in an hour and had to run to the store for more pumpkin yogurt. I am thinking this would be good with any fruit flavored yogurt ( that compliments bananas ) such as strawberry. And single serve yogurts (greek) are the perfect measurement, just dump it in. Can anyone please tell me if I can take out the sugar in this recipe so I can make it for a baby? I wouldn’t be able to substitute honey or Splenda in it but welcome any other suggestions-thank u!!! Hi Pam! I honestly can’t answer that, since I have never tried it that way. I hope someone else can answer your question for you! 🙂 Thanks for stopping by! I made the perfect banana bread many times and it’s a winner every time. My husband wants me to make two loaf every time as one is gone so quick. Thankyou for the great recipe. Just tried this recipe. I added chocolate chips as well as walnuts😬 Fingers crossed 🤞. Pretty simple to put together, but I’m not usually a baker so we’ll see when it comes out. I’ve just made the 2nd batch…the first I made muffins. It made 18 standard size muffins, baked 23 minutes. I’ve got a loaf in now so I’ll be up to 1 am till it’s done, my house smells amazing, but I’ll have to wait for breakfast to try it 😟. If they taste as good as they smell I’ll be in heaven. My mom always made a Bisquick recipe, this one is just as easy so I’d rather do this scratch recipe. Thank you…and Martha!